An intense and pleasant way of healing, in which the sounds vibrate through your entire body and awaken the spirit. There is no talking, only and purely the sounds of the drums and singing. We work with small groups. You can lie down comfortably and let all the sounds flow through you. In a natural way the definitions vanish and you enter the dreamstate, where nothing is fixed and everything is fluid. This is the state of the "reset", in this state true healing is possible. You are welcome to join for healing, or just to charge the battery again, or for further knowledge and experience on the path of visions. On different evenings, in Haarlem, 8pm till 9.30 pm, you're welcome from 7.45pm. For people who are seeking healing. This can be physical or on any other level of your life. There are no restrictions regarding what is possible in healing. 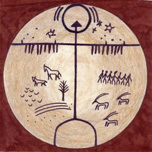 Shamanic healing takes place when the spirit finds its home again. Its natural place, its natural space, its destination, and its natural connections and sources of energy and inspiration. Matter follows the spirit. It is not the other way around. That's why there are no restrictions on what is possible in healing. Healing-appointments are individual and by appointment. Location: Heemstede (20 minutes by train from Amsterdam) or Renkum. We also love to give Thai Massage. These sessions take around one-and-a-half hour and cost €50,-. The place to be is Heemstede, or Renkum.